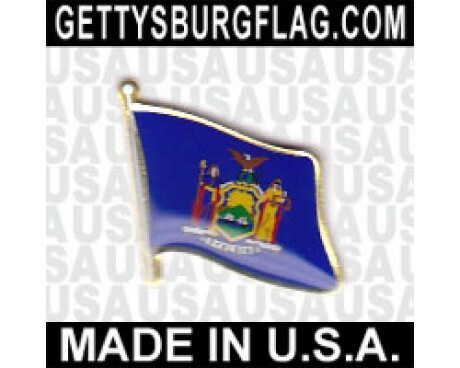 The New York state flag features design elements that are almost as old as the United States. The symbolic value of the design has been defined in much greater detail than many other state flags, which is likely a result of the design's age. 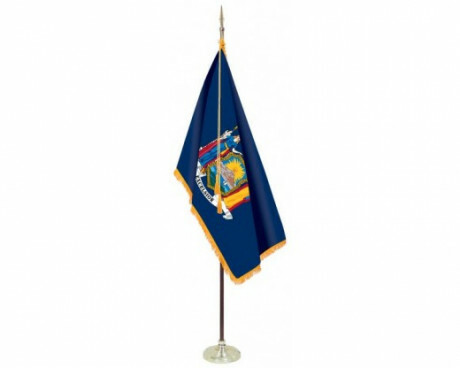 The state flag of New York features the state's coat of arms on a dark blue field. The coat of arms displays a shield that is decorated with a representation of the Hudson River with the sun rising above it as two ships sail near the shore. The scene emphasizes the importance of the river and the trade that it carried to the history of New York. The shield is supported by the personifications of Liberty and Justice, which represent the two virtues which the government strives to embody. A globe stands on top of the shield, and an eagle stands on top of the globe. The globe represents the combination of the new and old worlds in America, while the eagle represents the state's future. 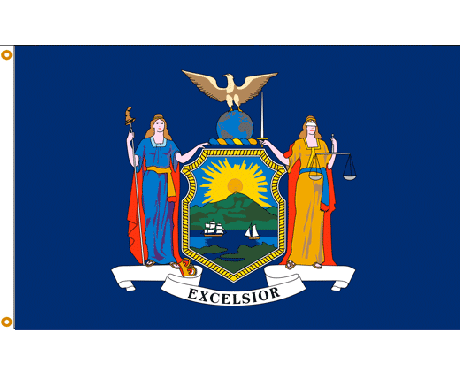 The current New York state flag dates back to the start of the 20th century, but a precursor to the design can be traced to 1779. 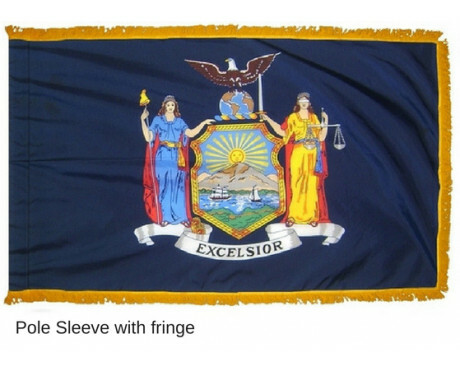 The original design featured the same coat of arms as the modern New York state flag, but it displayed that coat of arms on a buff field rather than a blue field. 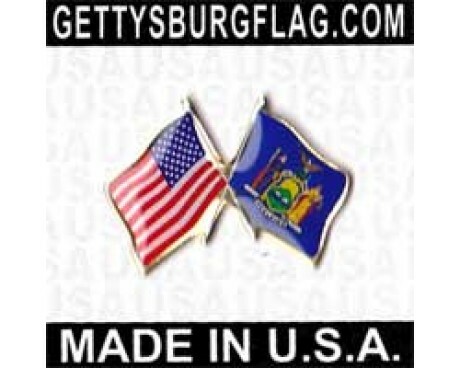 The buff field came from the uniforms that New York regiments wore during the Revolutionary War. George Washington chose to identify regiments from New York and New Hampshire with buff accents on their uniforms and buff fields for their flags. The color was chosen to honor the Dutch settlers who had initially settled in those areas. 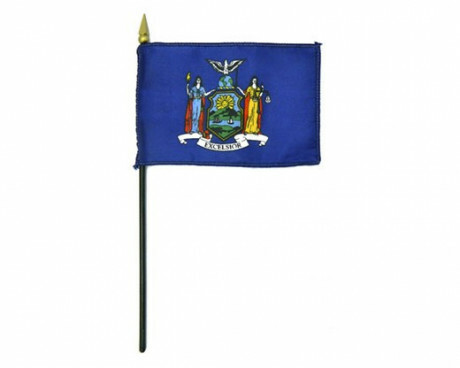 New York regiments also included the state's coat of arms on their flags, and those flags remained in use as state flags after the Revolutionary War reached its conclusion. 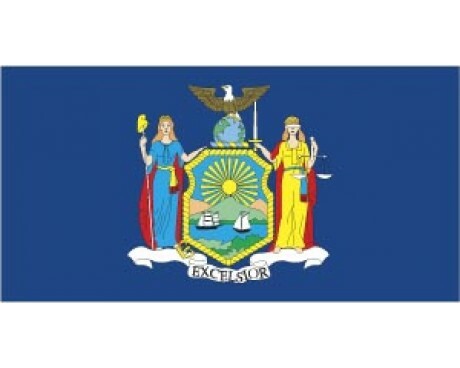 The state flag of New York was changed in 1901. 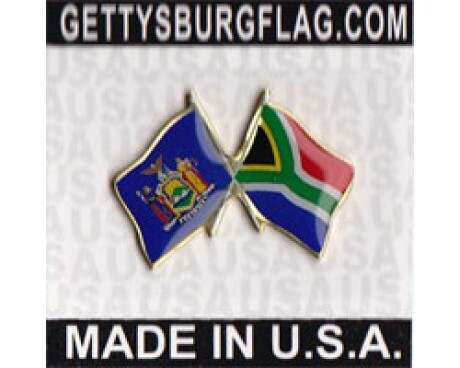 The buff field was replaced with a blue field at that time, which made the flag of New York bear a much stronger resemblance to the flags of many other states. 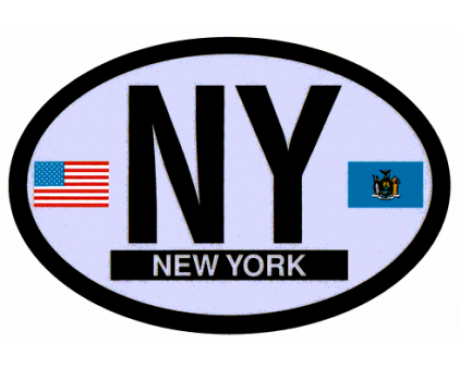 The design has not been changed since 1901, which makes the current New York flag one of the oldest in the country even though it is not the state's first design. In 1777 New York adopted its first constitution, and the state arms were designed. This design first appeared on the flag in 1778. The figures of Justice and Liberty support a shield in which boats are overlooked by the rising sun. An American eagle perched on top of a globe, and the state motto appears in the center of a scroll below the shield composing the crest. The military flag consisted of the arms on a blue field, and in 1858 a similar flag was adopted for the state troops, but with a white background during the War of Revolution. In April 1898 the white background was changed to a buff color to match the soldiers uniforms. A few years later the color reverted to blue and remains unchanged. In 1609 Henry Hudson, whom the river is named, claimed the area for the Dutch. In 1624 the first colonists arrived, and in 1644 the colony was taken over by Britain. On April 20, 1777 New York declared Independence, and the state ratified the Constitution the following year.